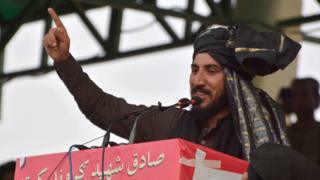 Tens of thousands of Pashtuns are demanding an end to extrajudicial killings and abductions they blame on the Pakistani state - and a charismatic young man has become their spokesman. A compelling, bearded tribesman in his late 20s, Manzoor Pashteen is the unlikely figurehead for protests that have now mushroomed into a wider movement that threatens to upset a precarious balance ahead of general elections. He represents people who say they were brutalised during decades of war in the border areas Pakistan shares with Afghanistan. NGOs say thousands of people have been reported missing in regions such as the Federally Administered Tribal Areas (Fata) and Balochistan. Over the weekend thousands of people attended a rally in Lahore, defying calls from the authorities to boycott the event, and despite officials briefly detaining some leaders of the movement in raids. The Pashtun Tahaffuz Movement (PTM, Pashtun Protection Movement) is expressly peaceful, and its demands are within the limits of Pakistani law. But the pressure it has placed on the country's leaders is telling. Even army chief Qamar Javed Bajwa has become involved, calling the protests "engineered", implying they are following a hostile foreign agenda, although they appear spontaneous. "What kind of freedom is this?" the crowd chant. It's the chorus of the anthem of this protest movement, and one that encapsulates the myriad grievances from Pakistan's "war on terror". A common thread is a feeling that Pashtuns have been caught between the militants and the military for years. One man from the Swat Valley tells me how on a single road there would be checkpoints by both the Taliban and the army. If you were clean-shaven the Taliban would accuse you of being pro-government, if you had a beard soldiers accused you of being an extremist. At a stall on the side of the protest, activists are writing the names of young men allegedly in the custody of the intelligence services, but never produced in court. It's one of the most sensitive issues in the country - I'm surrounded by people wanting to tell me what happened to their relatives. Resentment towards the powerful military establishment is expressed most boldly by the slogan, "The ones responsible for terrorism are the ones in uniform". This kind of open challenge is more or less unprecedented in recent times, and seems to be growing. So far there has also been an almost total media blackout of PTM rallies, which attract substantial support. It is a notable contrast to the air time given on Pakistan's increasingly controlled media to small bands of anti-PTM protesters. Those didn't get much traction with the public and are suspected of links with the military. Manzoor Pashteen speaks Pashto in his native Mehsud dialect. But unlike other young tribesmen he is educated, and can speak Urdu and English with the same ease. He says he never realised he would get such support but he's clear about what needs to change. "People were oppressed. Their life had become intolerable. Curfews and insults by the army soldiers had stripped them of their pride," he told BBC Pashto's Khudai Noor Nasar in March. Since February, he and his supporters have travelled across the Pashtun heartlands, from Quetta to Peshawar, attracting huge crowds and exposing never-ending stories of misery, death and destruction. Many see the PTM as breaking new ground in the political landscape of a country where proxy wars have disenfranchised large populations not only in tribal areas and the north-west, but also in Balochistan, southern Sindh province and the northern areas along the border with China. Mr Pashteen has said his movement won't participate in electoral politics. But even then, one expects them to have a strong off-stage voice when elections are held this summer. Well-known lawyer and columnist Babar Sattar has written that Pashteen's social consciousness may be rooted in his Pashtun identity, "but the questions he is asking are relevant for all of us". The debate triggered by the PTM is about the "coercive relationship between a citizen and the Pakistani state; [about] the character, priorities and actions of our state that are undermining... their rights to life, liberty, dignity and equality". Despite the media blackout the PTM has been successful in getting its message over through social media, with the help of a growing number of activists, mostly from areas seen as marginalised. In fact, Mr Pashteen says social media came to his rescue when he was arrested after protests against the army and its intelligence service, the ISI, last year. "Our house had been surrounded by the army who picked up my father and uncle and detained them at a nearby checkpost," he said in the BBC Pashto interview. "When I went there, they arrested me and put me in a room. They said protests against the army were detrimental to their morale." Soon, news of his arrest reached friends who spread the word, prompting protests in his support. "So they [the military] took me out and brought me to a brigadier who said we are releasing you, but tell your friends to stop their campaign." Manzoor Pashteen was born and raised in South Waziristan, which was the earliest of the Pakistan Taliban sanctuaries in the post-9/11 period. Like many other tribal districts and parts of the north-west, the local population's freedoms and livelihoods were held hostage - either by the army or the militants, who were seen as the military's proxies despite all the denials. The son of a school teacher, he was lucky to have easy access to education which continued when his family left conflict-ridden South Waziristan in 2010. It was a time when families had to move from their villages and take refuge in faraway towns and cities like Bannu, Peshawar, Lahore and Karachi. For that generation, political awareness was shaped by exposure to life outside Waziristan, and their experience of disempowerment when they moved back to their villages. As one former senator, Afrasiab Khatak, puts it, "the lava accumulated through all these troubles and tribulations was waiting to erupt. It was only a matter of time". That time came when a young man called Naqeebullah from South Waziristan was killed by police in an alleged "staged encounter" in Karachi on 13 January. Police said he was a militant but his family say he was just an aspiring model. This provided the spark for a demonstration outside the Islamabad press club in January. At first nobody took much notice, but then numbers began to swell. A shipping container turned up and they made it a stage with a sound system and began making speeches, some extremely critical of the security establishment. After 10 days it had evolved into a wider movement for the "liberation of Pashtun people from the tyranny" of Pakistan's security establishment. People come from far and wide to the rallies, many with pictures of the missing in search of information. "I only knew the conditions in my own area. But when we heard stories from other areas - from Swat, or Bajaur - we realised that it was the same all over," Manzoor Pashteen says. He relates one incident that led to protests two weeks before his arrest last October. A bomb had killed a soldier in the village of Shamkai in South Waziristan. "The army clamped a curfew in the area, and ordered all people to come out of their homes," he says. "They made the women sit to one side and tortured the men one by one in front them. One epileptic boy died during torture while his mother and father were watching." The BBC put these claims to the military, but received no response. But many say it is still fair to ask if Pashtuns could be partly to blame for allowing their youth to join militancy. It is a question that Manzoor Pashteen dismisses. "The Pakistani state promoted militancy. It used Islam as a motivating factor," he says. "These are not my words. These are the words of Colonel Imam [a former ISI operative] who said he trained 95,000 youth; or the words of then army chief Pervez Musharraf, who said 'we trained them, we brought mujahideen from all over the world, and they were our heroes'. "When it suits them to bomb us, they'll bomb us; when it suits them to send us rations, they'll send us rations; when it suits them to set our people to kill others, they will train them and facilitate them," Manzoor Pashteen says. "Waziristan is their captured territory. It took us tribals 30 years to find out that we fought the Russians not for Islam, but for American money."